The following information and advice is provided by the District I Prince Georges County Police Department. Place items out of sight BEFORE reaching your destination. So place those items in a safe place before you get to the park, beach, baseball game, etc. Valuable items that thieves target are GPS units, MP3 players, credit cards, money, packages and so forth. 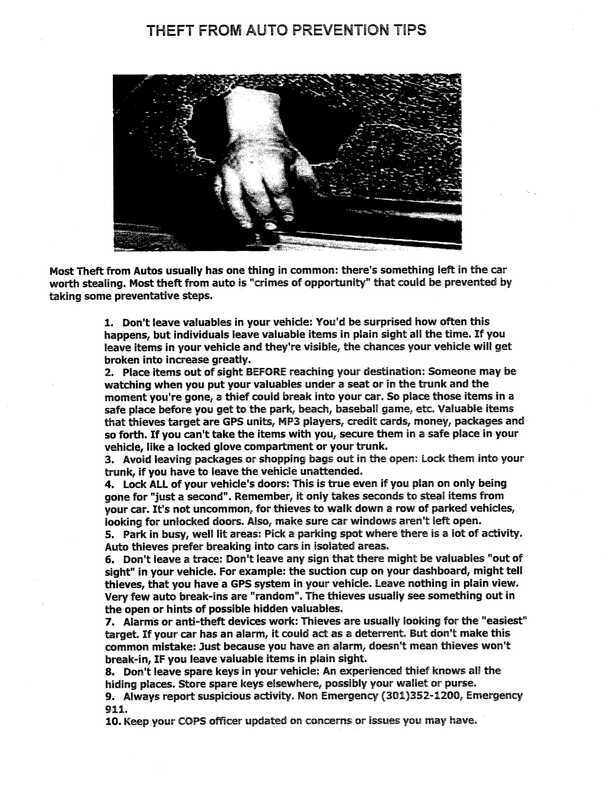 Lock ALL of your vehicle's doors. Also, make sure car windows aren't left open. Park in busy, well lit areas. Make sure your neighborhood is well lit if not notify Public Works/Pepco. Don't leave any sign that there might be valuables "out of sight" in your vehicle. For example: the suction cup on your dashboard, might tell thieves, that you have a GPS system in your vehicle. When walking into store (gas station or retail store) lock doors and windows. Always report suspicious activity. Prince Georges County Non Emergency (301)352-1200 or for Emergency 911. You can download a copy of Prince George's County's fact sheet on "Theft from Auto Prevention Tips" here. Leave lights on when you go out. Don't allow daily deliveries of mail, newspapers or flyers build up while you are away. Install deadbolt locks on all your outside doors. Lawn mowers, snow blowers, barbecues and bicycles are best stored out of sight. Change locks immediately if your keys are lost or stolen. When moving into a new home, have all locks changed. Have adequate exterior lighting. A motion-sensitive light is recommended for backyards.Trim trees and shrubs so that they cannot be used as hiding places for intruders. An alarm system is excellent for home security. Use a neighbor's phone/personal cell phone to call police. Never leave keys under doormats, flowerpots, mailboxes or other "secret" hiding places -- burglars know where to look for hidden keys. Keep a detailed inventory of your valuable possessions, including a description of the items, date of purchase and original value, and serial numbers, and keep a copy in a safe place away from home -- this is a good precaution in case of fires or other disasters. Make a photographic or video record of valuable objects, heirlooms and antiques. Your insurance company can provide assistance in making and keeping your inventory. Be a good neighbor. If you notice anything suspicious in your neighborhood, call 9­1­1 immediately. Mark your valuables with your driver's license number with an engraver. Your District I Community Oriented Police officer (COPS Officer) can assist you with engraving you items. Marked items are harder for a burglar to dispose of and easier for police to recover. To locate your COPS officer call District 1 Police Station at 301-699-2630. Form a Neighborhood Watch Group. COPS officers can assist neighborhoods with resources to build a neighborhood watch. The MOST important thing YOU can do is CALL THE POLICE to report a CRIME or any SUSPICIOUS activity. You have to be the eyes of your neighborhood. And remember you can always remain a pair of anonymous eyes!